On Friday... we packed up and headed to a couple of destinations. 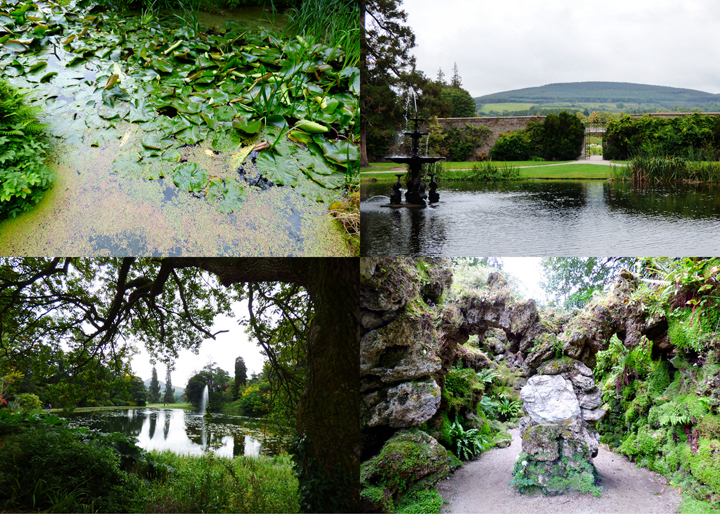 First stop: Powerscourt Estate & Gardens. It was a short drive outside of the Dublin suburbs to Powerscourt. We passed by this beautiful blue church too fast for me to get a picture so I had us turn around so I could get a shot. Could it be any cuter? Walking from the car to the estate Chris told me this is where they filmed the hot air balloon scene in Count of Monte Cristo. Say whaaaaaat!!!? I LOOOOOOOVE that movie. I've seen it probably more than 40 times. We pulled up YouTube and watched the very scene in anticipation of seeing it with our own eyes. Powerscourt became a million times cooler in my eyes after knowing this tidbit. First thing I noticed walking into the estate: chandeliers! Gift shops galore right off the bat. About Powerscourt: A mile above the village of Enniskerry, the Gardens of Powerscourt cover several thousand acres within the 16,000 acre estate. The dreamy driveway alone is a mile long. We actually thought we must have made a wrong turn because the driveway seemed to go on forever! While the mansion's interior, only partially restored after a 1974 fire, isn't much, its meticulously kept aristocratic gardens are Ireland's best. 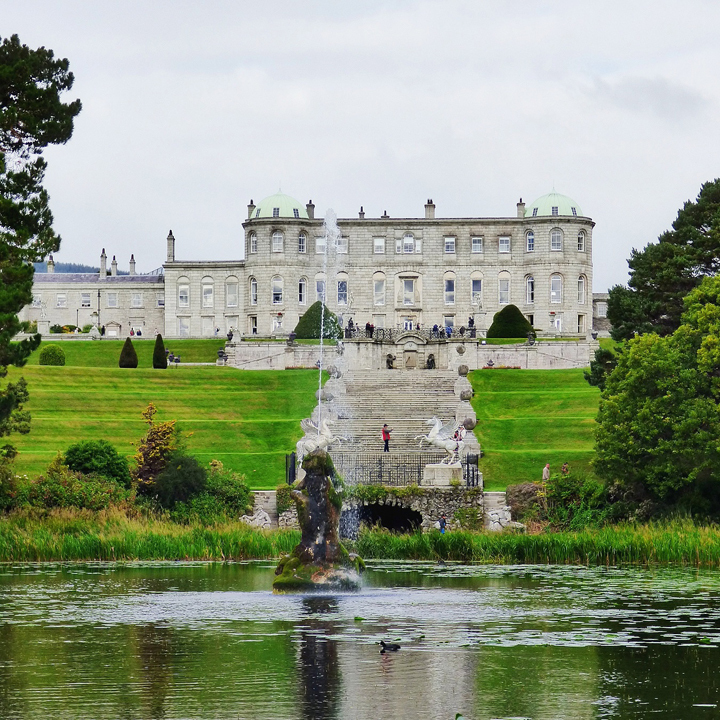 The house was commissioned in the 1730s by Richard Wingfield, first viscount of Powerscourt. The gardens, created during the Victorian era (1858-1875) are called the grand finale of Europe's formal gardening tradition and probably the last garden of its size and quality ever created. The impressive summit of the Great Sugar Loaf Mountain acts as a fitting backdrop for these sumptuous grounds. After buying your ticket you get a map of the estate that lays out two walks. We opted for the longer one that explored all the various aspects of the gardens. Loved it. Any Count of Monte Cristo fans recognize this? Looking back at the house from behind the main lake. Kids running through "the deep dark woods" as they called it, and a pegasus. Keeping with the Romantic tradition of the time, a faux fortress was built on the grounds complete with cannons and a tall stone tower. Chris hiked up and took this picture of me and the kids down below. Just down from the fortress was a fine Japanese garden. Looking up at the estate. You know what they say... take time to stop and smell the roses flowers! 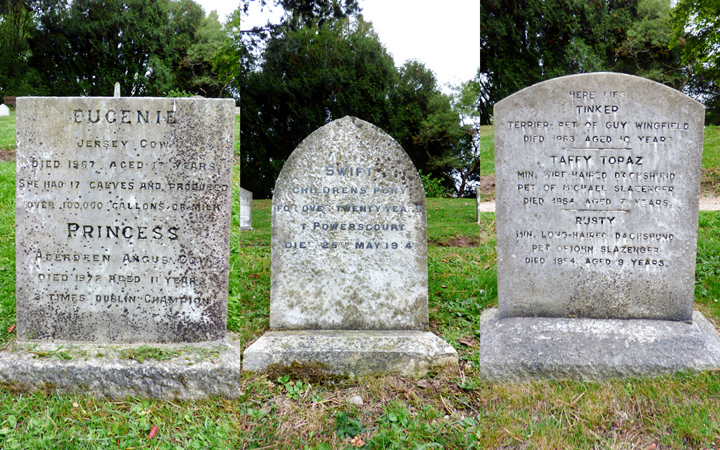 Headstones of the departed critters - you gotta read some of these, they're awesome. Clump of trees. Flower beds in the walled gardens. When you watch the movie, you'll see this fancy stonework as he is stepping out of the balloon and walking toward the railing. Yep, this is totally the place from the movie. So awesome! After we were done walking around the gardens (which, is one of my most favorite things to do: walk around fancy places and pretend I live there) we made my favorite memory of the trip: inside we went to the cafe and bought a few yummy sugary scones and croissants and enjoyed eating them. I don't even have a picture, darn it! I dunno why it's my favorite part of the whole trip, it was such a simple thing, and yet, it stands out the most in my mind. 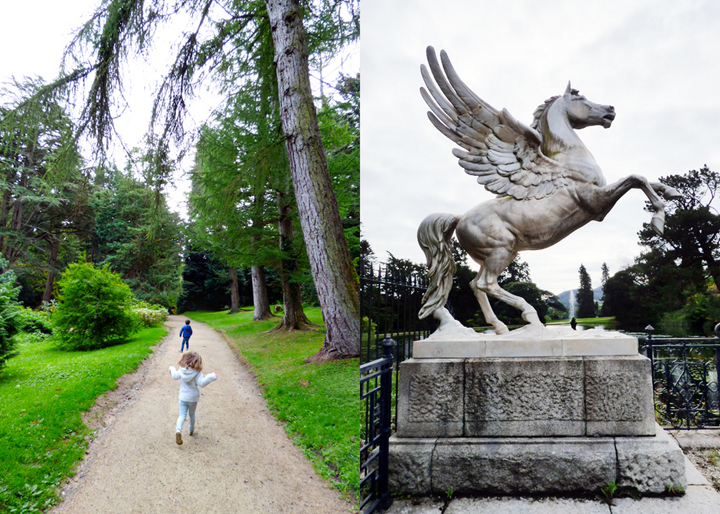 Evans family at Powerscourt Estate & Gardens on Friday September 18th 2015. Next stop: Rock of Cashel. How exciting!!! LOVING all the photos!!!!! I loooove that movie!! So cool you got to go there! !